Color Guards reflect the pride that citizens of a country take in their nations and flags. The precision and dignity that a Guard brings to the arrival of a flag can be inspirational to the those who the flag represents. As I’ve mentioned, I work a little overtime in a sports arena. I see plenty of color guards there. Those groups are polished, precise and very particular about how they complete their duties. They concern me. I’m inside the arena an hour before the doors open to the public. Usually I will grab a chair and watch the final preparations for the game. Players warm up, the dance team runs through their routine, someone practices the anthem. The Color Guard walks through the flag presentation. Most Color Guards walk through two or three times. There is a good bit of discussion: the group enters from this tunnel, marches to there, pivots after six counts, stops at some unseen mark on the floor. So many details to be tended to. But there is one detail I’ve never heard discussed. Maybe they talk about it in the car on the way over. What are they supposed to do if they actually have to guard the flag? They’ve got rifles, they are called a guard. Those things imply a level of responsibility and a willingness to act upon that responsibility. They are charged with protecting the colors of a nation. Are there rules of engagement should those colors need protecting? Are the rules different for a sports event and a parade? Parades bring their own perils. An errant shot could knock Biff Murphy, Sports Director for Eyewitness News 3, right off the float behind the flags. I know that’s probably not the worst thing that can happen, but everyone has a mother, even local TV “personalities”. 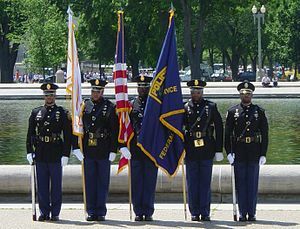 Most Color Guard units are military or police based. 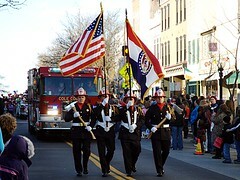 But let us not forget that our friends in The Fire Service have color guards too. They carry big chrome axes. I think they do that because hoses would get kinks in them when the guard turned corners. A trickle of water from a kinked hose neither impresses nor terrifies. Consider the level of savagery that is implied by someone with an ax guarding a flag, or anything else. How very Viking of them. Sure, Biff Murphy fares better in an ax situation, but the brutality of swinging one of those things at a body. I shudder to type about it. I call upon the legislatures of all nations to convene hearings on this matter. All people, their nations and the colors that represent those nations deserve proper respect and dignity. But resolutions should be passed specifying the levels of protection we give to the symbols of our countries before things get out of hand and Biff gets picked off a float. Not that Biff getting picked off a float is the worst thing that can happen. What about the girls that march in front of a band & wave flags around with absolutely no weapons? When I was 20, I dated an 18 year old who was in colorgaurd and something called winterguard. I used to go to the competitions of scantily clad girls waving around flags and ribbons to mostly horrible music… It was almost more than I could handle on a few different levels. Those color guard girls are tough. When I went to marching band competitions with my son I’d see girls catch a flag in the face and keep working the routine. Do those rifles really fire, or are they simply ornamental? Guess I never considered color guards might be dangerous. Why, what if one of the members flipped and started taking out parade-watchers? Scary stuff. Perhaps you’ve done us a public service in bringing this to our attention! Some of the military weapons look real. The axes speak for themselves, so to speak. Who guards the color guards? Do they have a backup? Are the color guard guards to ensure the color guards don’t loose their colors? If someone captures the flag and they become colorless, can the color guard guards jump into action to retrieve it? When their flag is captured, a color guard should transform into Color SEALS. They’ll go get the flag back or capture a new one. Their problem will be, only two of them are armed. This made me wonder; color guards are honor guards, and normally non-military honor guards [like drill teams] carry wooden rifles. Military honor guards are armed, but in my understanding the only time the rifles are loaded is when there is a salute and then they are loaded with blanks. But I did some research and found this “The flagbearers are unarmed. The guards are armed with rifles or revolvers, but ammunition will not be issued to color guards performing a strictly ceremonial function.” http://drillpad.net/DPcolorguard(AF).htm So I don’t know if you were being serious or tongue in cheek with your concern, but I don’t think a military honor guard would be able to defend the flag with bullets, but if necessary I’m sure they would defend it in other ways. I was on the colorguard in high school. Which, in marching band, means we get to twirl the flags. Way more fun. We also twirled sabers, rifles, and Chinese fans for some reason. Perhaps they all just throw themselves on top of it in a big pile to protect it? Why do you think there is a pointy thing on the end of the flag pole? Attack a Color Guard, get shish-ka-bobbed. Hmmm . . . puts me in the mood for BBQ. To be quite honest with you, if I was in a color guard on home soil & it was more like an honorary thing – I would be happy to let someone have my flag if they really wanted it rather than get shot over it.